The embassy was inaugurated in Porta Angelica street in the Vatican, Italy’s Corriere della Sera newspaper reported. “This [the embassy] is a sign that the Pope loves the Palestinian people and he loves peace,” Abbas said, the newspaper reported. Later Abbas and Pope Francis held a meeting behind closed doors which lasted 23 minutes. “I met with His Holiness. 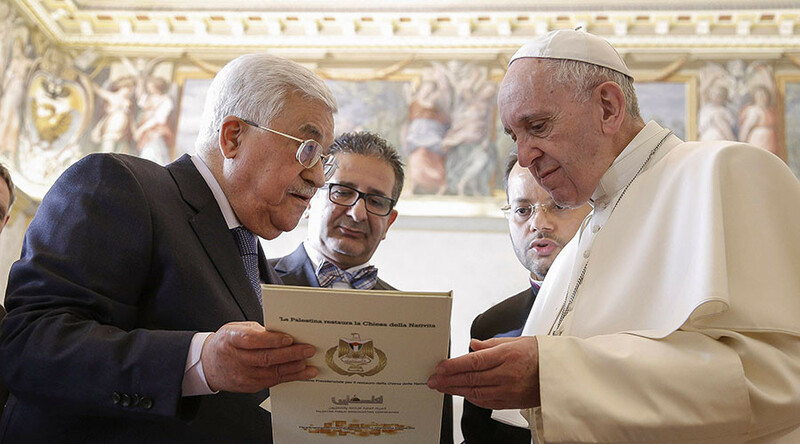 The Vatican has fully recognized Palestine as an independent state, I hope that other states take their example from the Holy See,” Abbas later told journalists. Direct negotiations between Israel and Palestine should “be resumed to bring an end to the violence that causes unacceptable suffering to civilian populations, and to find a just and lasting solution,” it added. In January 2016, the Vatican announced that a “comprehensive agreement” with the “State of Palestine” signed in June 2015 had come into force. Vatican referred to Palestine as “a state,” giving it full recognition as an equal partner. The treaty secured the rights and privileges of the Catholic Church in the Palestinian territories in exchange for brokering a two-state solution as well as giving more weight to Palestine’s political stance in the world. It also included clauses on safeguarding the holy sites in Palestine, equally important for all three Abrahamic religions. Pope Francis has called for Israeli-Palestinian talks to be resumed, though the Vatican has provided no detailed political roadmap for reconciliation. In May 2014, Pope Francis visited Bethlehem, where he gave a public speech outlining both Israel’s and Palestine’s right to exist. He praised Palestinian President Mahmoud Abbas as a “man of peace,” laying the groundwork for the bilateral treaty.